Cleo - Save-A-Life, Inc.Save-A-Life, Inc. While at PetsMart three years ago, my daughter spotted an adorable Yorkie shopping with her owner. 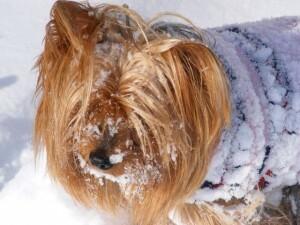 Knowing I had always wanted a Yorkie, my daughter would have nothing more but for us to go ask if we could pet the dog. Imagine my surprise that when we caught up with the woman, she was actually handing her dog, Cleo, over to Save-A-Life! The dog owner asked the Save-A-Life representative to give the dog to us, but had already signed the papers so it wasn’t her decision. Oddly enough, we had a hamster at the same time named Cleo and that was why we were in PetsMart. We applied to adopt Cleo and were called within a week. Cleo is the smartest, sweetest, and most spoiled dog we have ever known. She goes with us everywhere. We moved to Michigan over the summer and she loves the snow! She loves to “chase” the squirrels and deer that are outside our fence. Thank you Save-A-Life!